When an indistinct woman named Charlotte leaves a train station in hopes of changing her life forever, she's followed by a mysterious stranger with ill intentions. A physician works for a company that harasses its employees. The physician tries to change this situation. An actress, a writer, a student, and a government worker band together in an effort to escape Paris as the Nazis move into the city. Story of a cartoonist who decides to get married and have a family. Adolphe: [to Ellénore, dying] Ellénore, I don't want to be free any more. This movie has not been released yet in the U.S. and who knows if it ever will be. Fortunately, I have a multi-region DVD player so I ordered the DVD from amazon.fr. I enjoyed "Adolphe" very much. The story is quite sad (A young man pursues a beautiful older woman. She in turn becomes obsessed with him, even leaving her own children for this doomed affair.) but engaging and hard to forget. Isabelle Adjani shines as the tragic Ellenore. Ms. Adjani hasn't been in the public eye since the mid-90s (except for 2001's "La Repentie") and I'm thrilled to see my favorite actress back in such a challenging role. The movie itself comes across more like theater than film - its very minimalist. Such technique, keeps one focused on the story but may come across as boring to viewers used to big-budget productions. The attention to detail in the costumes and other peroid data is very good. Hopefully this film will eventually be shown outside France for the rest of the world to enjoy. Until then, if you have a multi- region DVD player or a computer than can view region 2 DVDs, you can order it from amazon.fr. 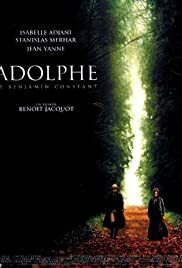 If you're a fan of Isabelle Adjani and her work in such films as "L'historie d'Adele H, Camille Claudel and La Reine Margot, you wont be disappointed.